Utah Royals FC earned their first win on the road beating Sky Blue FC 2-1 at Yurcak Field in Piscataway, New Jersey on Saturday night. Until the 85th minute, the game was level with both teams getting one in the back of the net in the first half. Utah Royals FC got on the board first thanks to a Diana Matheson goal in the third minute. And then the home team equalized just minutes later with a goal from forward Shea Groom in the tenth minute. In the 85th minute, Utah took the lead after an own goal from Sky Blue FC defender Mandy Freeman. Sky Blue FC remains in pursuit of their first win of the year at 0-8-1 overall, and Utah Royals FC are now 3-2-5 in league play. Sky Blue FC, now nine games without a win, have also not led in the game for 810 minutes of league play. Sky Blue will enter their next match with just one point, second only to the 2013 Seattle Reign for the longest winless start to a season (11 games) and tied with the 2013 Reign for the fewest points heading into game nine (1 point). Several players from both Sky Blue and Utah were recently called up for national team duty ahead of the upcoming June friendlies for the U.S. women’s national team and missed this weekend’s NWSL game. From Utah, goalkeeper Abby Smith, defender Becky Sauerbrunn, and forward Amy Rodriguez were called up. For Sky Blue, forward Savannah McCaskill and midfielder Carli Lloyd got the nod. This meant both sides had to mix up their starting lineups and for Utah Royals FC head coach Laura Harvey called on longtime NWSL goalkeeper Nicole Barnhart to start in net. Barnhart earned the win in her 109th NWSL appearance and finished with two saves on the night. The visitors got on the scoreboard just three minutes into the game when Gunnhildur Jónsdóttir won the ball in the midfield and eventually got a service in behind the Sky Blue backline to find Matheson crashing far post. Matheson slid and scored to earn her second goal of the season and put her side up 1-0. Matheson now has two goals and one assist on the year. She finished the game with two shots.
.@dmatheson8 starts off this one off for @UtahRoyalsFC with a ? Sky Blue FC got one back just minutes later, when defender Amanda Frisbie played the ball up the line to forward Katie Johnson. Johnson used her pace to beat Utah’s last line of defense and slotted it back to Groom who was able to finish it one-time for the big equalizer in the 10th minute. This was Groom’s first goal for Sky Blue. She finished the game with three shots. 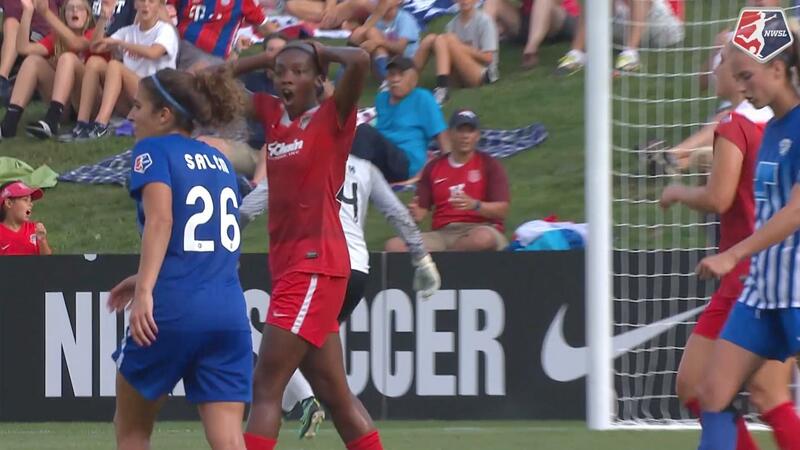 Utah’s best chance to take the lead came just before the break in the 40th minute when midfielder Desiree Scott poked the ball away from Sky Blue just above the box. Scott’s win found the feet of Utah forward Katie Stengel who struck it one-time. Sky Blue FC goalkeeper Kailen Sheridan made the initial save, but the ball bobbled out of her hands into the feet of forward Katrina Gorry. Gorry dropped the ball back to Corsie, but Corsie’s shot went right into the hands of Sheridan. In the second half, Sky Blue FC midfielder Raquel Rodriguez entered the game and instantaneously added a boost to the home team’s attack. She finished the game with a 84.6% passing accuracy rate, for the highest on her team. 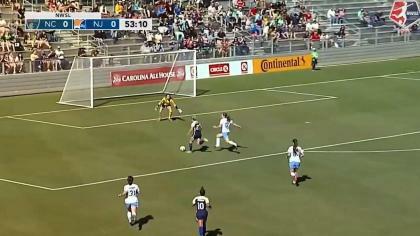 In the 54th minute, Sky Blue defender Rebekah Stott found Johnson at the top of the box and Johnson flicked it on to midfielder Madison Tiernan. Tiernan got off a huge strike that cruised just over the crossbar. In the 61st minute Utah Royals FC had a nice build-up in the midfield that bounced around, with Scott controlling it time and time again for her team. Eventually, Gorry had an open shot and got one off that forced Sheridan to make a diving save to the far right post. Scott finished the night with a game-high 90.3% passing accuracy rate in 33 passes and also made three tackles and two interceptions in the win. The game was later sealed in the 85th minute when Jónsdóttir exposed Sky Blue FC down the flank and served the ball across the box to force an own goal from Sky Blue’s Mandy Freeman who was running towards her own goal. Sky Blue finished the game with nine shots to Utah’s seven, however the visitors held the advantage in possession with 55% to Sky Blue’s 45%. Utah will continue their road trip in Week 11 when they visit the North Carolina Courage on June 16 after the FIFA break. Sky Blue will look to for their first win when they host the Washington Spirit on Friday, June 8 just before the break. Match ends, Sky Blue 1, Utah Royals 2. Second Half ends, Sky Blue 1, Utah Royals 2. Lo'eau LaBonta (Utah Royals) wins a free kick on the left wing. Brittany Ratcliffe (Utah Royals) wins a free kick on the left wing. Foul by Christina Gibbons (Sky Blue). Brooke Elby (Utah Royals) wins a free kick in the defensive half. Substitution, Utah Royals. Brittany Ratcliffe replaces Katie Stengel. 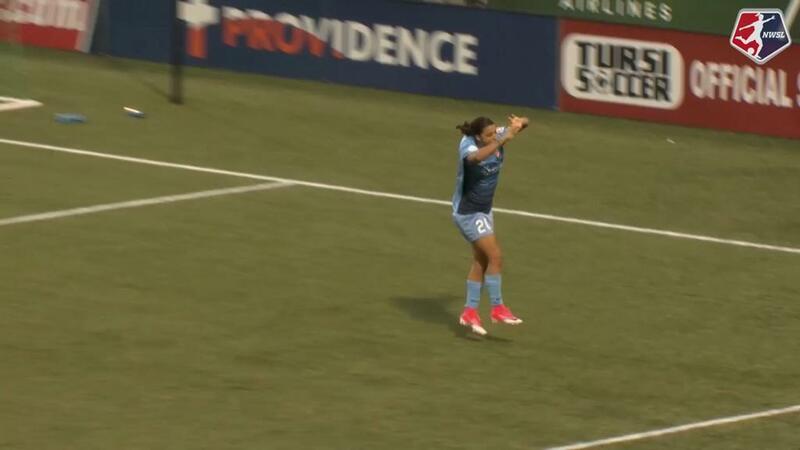 Own Goal by Mandy Freeman, Sky Blue. Sky Blue 1, Utah Royals 2. Attempt saved. Dominique Richardson (Sky Blue) right footed shot from outside the box is saved in the centre of the goal. Corner, Sky Blue. Conceded by Brooke Elby. Nicole Barnhart (Utah Royals) wins a free kick in the defensive half. Delay in match Rebekah Stott (Sky Blue) because of an injury. Foul by Katie Stengel (Utah Royals). Rebekah Stott (Sky Blue) wins a free kick on the left wing. Offside, Utah Royals. Sidney Miramontez tries a through ball, but Katie Stengel is caught offside. Attempt missed. Janine Beckie (Sky Blue) left footed shot from outside the box is close, but misses to the left. Substitution, Sky Blue. Jennifer Hoy replaces Katie Johnson. Substitution, Utah Royals. Elise Thorsnes replaces Katrina-Lee Gorry. Attempt saved. Katrina-Lee Gorry (Utah Royals) right footed shot from outside the box is saved in the bottom left corner. Corner, Utah Royals. Conceded by Mandy Freeman. Substitution, Utah Royals. Lo'eau LaBonta replaces Taylor Lytle. Corner, Sky Blue. Conceded by Diana Matheson. Attempt missed. Shea Groom (Sky Blue) right footed shot from a difficult angle on the right misses to the left. Assisted by Rebekah Stott with a cross following a corner. Corner, Sky Blue. Conceded by Rebecca Moros. Attempt saved. Katrina-Lee Gorry (Utah Royals) right footed shot from outside the box is saved in the bottom right corner. Assisted by Desiree Scott. Substitution, Sky Blue. Raquel Rodríguez replaces Thaisa. Corner, Sky Blue. Conceded by Rachel Corsie. Offside, Utah Royals. Brooke Elby tries a through ball, but Diana Matheson is caught offside. Attempt missed. Madison Tiernan (Sky Blue) left footed shot from outside the box is too high. Assisted by Katie Johnson. Attempt missed. Shea Groom (Sky Blue) header from the centre of the box is too high. Assisted by Rebekah Stott with a cross. Corner, Sky Blue. Conceded by Sidney Miramontez. Offside, Sky Blue. Shea Groom tries a through ball, but Katie Johnson is caught offside. Second Half begins Sky Blue 1, Utah Royals 1. First Half ends, Sky Blue 1, Utah Royals 1. Attempt saved. Janine Beckie (Sky Blue) left footed shot from a difficult angle on the left is saved in the bottom left corner. Assisted by Thaisa. Attempt blocked. Janine Beckie (Sky Blue) left footed shot from outside the box is blocked. Assisted by Rebekah Stott. Offside, Utah Royals. Nicole Barnhart tries a through ball, but Katie Stengel is caught offside. Attempt missed. Rachel Corsie (Utah Royals) right footed shot from the centre of the box is close, but misses to the right. Assisted by Katrina-Lee Gorry. Attempt saved. Katie Stengel (Utah Royals) left footed shot from outside the box is saved in the bottom right corner. Assisted by Desiree Scott. Corner, Utah Royals. Conceded by Shea Groom. Offside, Sky Blue. Madison Tiernan tries a through ball, but Katie Johnson is caught offside. Katrina-Lee Gorry (Utah Royals) wins a free kick on the right wing. Foul by Rebekah Stott (Sky Blue). Desiree Scott (Utah Royals) wins a free kick in the attacking half. Foul by Thaisa (Sky Blue). Foul by Rachel Corsie (Utah Royals). Katie Johnson (Sky Blue) wins a free kick in the defensive half. Substitution, Sky Blue. Dominique Richardson replaces Amanda Frisbie because of an injury. Attempt missed. Katrina-Lee Gorry (Utah Royals) left footed shot from the centre of the box misses to the left. Assisted by Katie Stengel. Delay in match Amanda Frisbie (Sky Blue) because of an injury. Corner, Sky Blue. Conceded by Nicole Barnhart. Offside, Sky Blue. Mandy Freeman tries a through ball, but Katie Johnson is caught offside. Foul by Rebecca Moros (Utah Royals). Madison Tiernan (Sky Blue) wins a free kick in the defensive half. Taylor Lytle (Utah Royals) wins a free kick in the defensive half. Offside, Utah Royals. Katrina-Lee Gorry tries a through ball, but Katie Stengel is caught offside. Offside, Utah Royals. Diana Matheson tries a through ball, but Katie Stengel is caught offside. Attempt missed. Diana Matheson (Utah Royals) right footed shot from the centre of the box is too high following a corner. Corner, Utah Royals. Conceded by Rebekah Stott. Goal! Sky Blue 1, Utah Royals 1. Shea Groom (Sky Blue) left footed shot from the left side of the box to the bottom right corner. Assisted by Katie Johnson. Offside, Sky Blue. Kailen Sheridan tries a through ball, but Katie Johnson is caught offside. Goal! Sky Blue 0, Utah Royals 1. Diana Matheson (Utah Royals) right footed shot from the right side of the six yard box to the top right corner. Assisted by Gunnhildur Yrsa Jonsdottir with a cross.